Lindsay BIRD MPETYANE is an important elder in the Utopia community and is the head man at Mulga Bore Outstation. He is married to Mavis Petyarre, and they have three daughters, Rosie, Jessie and Karen. Lindsay was the only male to participate in the silk batik project in the Robert Holmes a Court collection. Lindsay began painting in 1987 with a number of men including Louie Pwerle, Paddy Ngale and Billy Petyarre. Lindsay’s paintings are both iconic and linear. He uses the concentric circles and parallel lines with background dotting of ochre colours- yellow, red, black and white, and paints his Spear Straightening paintings with straight lines. He is also known for painting on a grey background. His paintings are in major public and private collections nationally and internationally. Brody, A. 1990, Utopia: a Picture Story, 88 silk Batiks from the Robert Holmes a Court Collection. 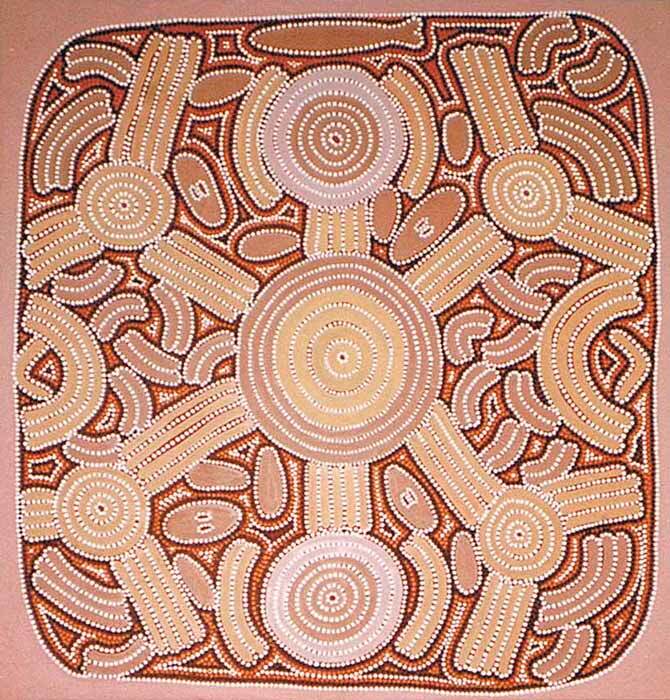 Johnson, V. 1994, Aboriginal Artists of the Western Desert, A Biographical Dictionary.